Last Thursday, I had the honor of meeting Vietnam veteran and novelist Tim O’Brien. Now, first things first: I honestly had never heard of Tim O’Brien before my invitation to attend a private reception for him at the Bone Student Center. I obviously needed to read one of his books before talking with him, so I got in touch with a few friends and they quickly suggested I start with O’Brien’s The Things They Carried. I ran to my nearest bookstore and picked up a copy. It astounded me! O’Brien writes mostly about his Vietnam experiences, but he calls his work fiction, and so therefore the reader never quite knows what “really” happened and what he’s fabricated. The Things They Carried utilizes such potent emotional honesty and simple, vivid imagery that it really does haunt me still to this day. O’Brien cuts to the core of what most of us are really like beneath are words and gestures. When the chips are down, when we’re called upon to rise above, O’Brien knows how most of us (admittedly himself included) will honestly react. His stories dig deep because we see ourselves in each of his characters, and most of us know that if we were put in the place of those characters, the end results would probably remain the same. I’m looking forward to reading more from Tim O’Brien, but this isn’t a book review, so I’ll move along to meeting the man. Armed with my (read) copy of The Things They Carried, I put on my best formal-but-not-too-formal outfit, grabbed an umbrella to ward off that day’s never-ending rain, and headed out. It had been a rough one with the baby that afternoon, so I was both a bit frazzled and running a little late. When I arrived at the Founders’ Suite in the Bone Student Center, I walked in, realized I had my book in a grocery bag to protect it from the rain, and walked right back out to find a garbage can. On the second take, I walked in and was quickly greeted by Toni Tucker-the event organizer-and her coworkers and interns. These friendly faces immediately helped relax me, and so I talked a bit with them, slapped on my nametag, propped my umbrella against the wall, and made my way into the main room where several people surrounded Mr. O’Brien and were having a pleasant conversation. Mr. O’Brien wore a black suit with a red tie and his ever-present baseball cap (which was navy blue, if you’re interested). I glided right past he and his group and made my way to the tasteful wine bar. Perhaps now would be the time to mention I get very nervous in general about a lot of things, but especially among people whose work I admire. For instance, when I met Michael Chabon in Chicago several months ago, I sounded like a total moron. I hoped I would do better with Tim O’Brien. So anyway, I approached the wine bar, asked for and took the bartender’s suggestion since I know nothing about wine, then grabbed the nearest wall where I could watch and listen to Tim O’Brien’s conversation without a chance of actually being drawn into it. Pretty soon one of Toni Tucker’s coworkers approached me and we had a nice talk, mostly about Elie Wiesel’s visit from a few weeks before. Then Toni herself appeared and asked me why I hadn’t spoken to Mr. O’Brien yet. My heart started racing and I muttered something about not wanting to overwhelm him with too many people, and she quickly scoffed at me and led me right up to the man. My mind emptied like an aboveground swimming pool full of bullet holes. I mumbled how thankful I was for his coming to visit us in Central Illinois, and he politely said it was his pleasure. Toni then asked if he’d sign my book, which he nicely agreed to do. As he was signing, my chronic verbal diarrhea attacked and I began talking about how happy I was to make it to his reception, that I’d been elbow-deep in poo-bombs all day with my baby girl, and I just wasn’t sure if she’d settle down enough for me to leave her. When Mr. O’Brien heard the word “poo,” I got the look. Michael Chabon had given it to me several months before. And like with Michael Chabon, I kept talking. And talking. My brain yelled “STOP TALKING!” but my mouth wouldn’t comply. He handed my book back to me, smiled, shook my hand, and then I wished him luck with his talk that night. Afterwards, I moped away, cursing my incessant need to talk about nothing when I get nervous. I spent the rest of the reception talking with a former coworker, his father, and some other nice people all-the-while wishing I had been more articulate and intelligent when meeting Mr. O’Brien. When I got home from the reception I discovered my daughter had developed a red bump on her tongue during my absence, which thankfully turned out to be nothing. An hour later, I left for ISU again to listen to Mr. O’Brien’s address at Braden Auditorium after my wife assured me she and baby would be fine. Toni had kindly given me front row tickets, so I settled in next to my former coworker and his father and thoroughly enjoyed Mr. O’Brien’s talk. He mostly told stories to illustrate his points about writing and life, and he was both hilarious and full of gravitas at the same time. This is not surprising considering his books are equally juxtaposed. I think the words that affected me most deeply were that when we send men and women to war, especially when a draft is in effect, we’re essentially sending children out to slaughter children. We teach them “Thou Shalt Not Kill” and then we toss them into combat and tell them you better kill somebody or we’ll throw you in jail. We are a society of contradictions and that sort of thing has to catch up with us one day-if it hasn’t already. He also warned us against anyone who deals in absolutism. I’ve always been terrified of those people who see things from only one perspective without any willingness to consider another angle, and Mr. O’Brien solidified my fears. Absolutes are the quickest way to war, and also the quickest way to make sure children slaughter other children. But you have to understand that Mr. O’Brien was not pulling the self-righteous card. He offered several instances when he did not act bravely. He recounted an event where one of his fellow soldiers picked on an old, Vietnamese man and he didn’t intervene. He spoke in great detail about killing an enemy soldier with a hand grenade whom he could have allowed to walk unknowingly by and how he still sees the man in his thoughts to this day. He talked about many moments of insanity in Vietnam, and he also spoke about rare moments of true, moral fortitude. He was there, and he shared with us those things from Vietnam he still carries. While I was at his talk, the neighborhood’s power went out and my wife had been on her hands and knees crawling up the steps in search of a flashlight. My daughter, never before subjected to complete darkness, was not handling the situation well. Eventually they found a flashlight, the baby settled down, and after I got home we all sat together and waited for the electricity to return, which it did two hours later. 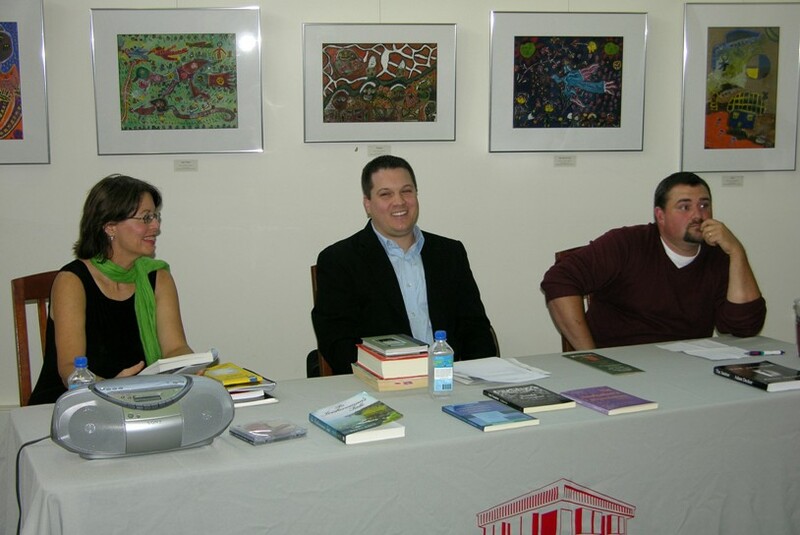 Here’s a photograph my father took from the panel discussion on publishing I took part in on September 23rd at Milner Library. Also pictured are novelists Adam Decker and Patti Lacy. Joanna Pelletier, staff writer for Illinois State University’s The Daily Vidette, wrote an article about my appearance yesterday at Milner Library’s panel discussion on publishing. Authors Adam Decker and Patti Lacey also took part in the event organized by Toni Tucker and her staff at Milner Library. 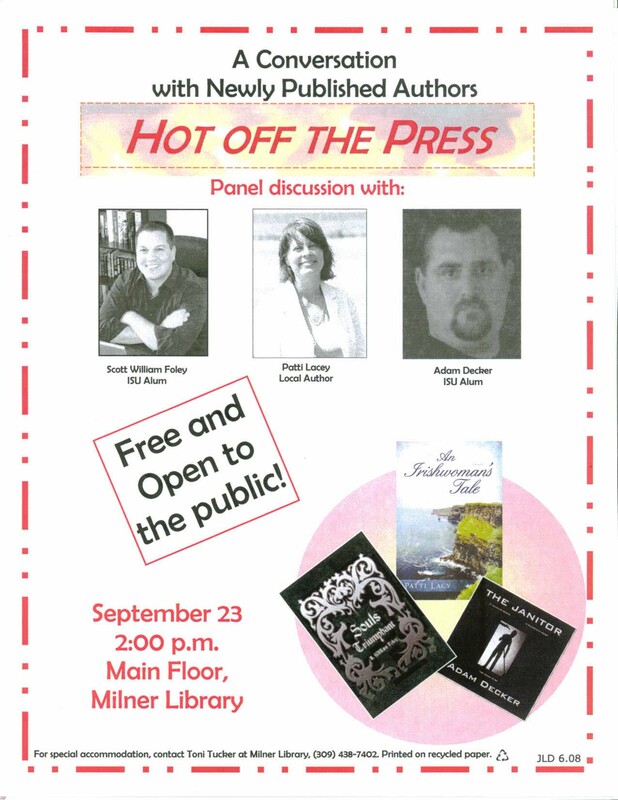 Yesterday I took part in a panel discussion on publishing at Milner Library. The other authors were Patti Lacy and Adam Decker, and, judging from all the notes I saw the audience taking, the three of us offered some diverse and informative ideas and experiences about the world of print. I know I learned a few new things from my fellow authors as well! I wanted to specifically thank Toni Tucker and her staff at Milner Library for inviting me to take part in such a fun discussion and for working so hard to promote a very well-organized event.